Posted on Thursday, September 9, 2010, by Eric - TV Geek Army "Revered Leader"
The news is so huge that I have to take a step back for a moment to give a little background. Stephen King's Dark Tower series is a fictional masterpiece (and a huge one at that, coming in at seven huge novels) that I feel very close to. I read the first installment, The Gunslinger, at the perfect time – somewhere around the 7th grade – to be completely swept away to a strange yet strangely familiar new world. The man in black fled across the desert, and the gunslinger followed. No other sentence has ever struck me in quite the same way since. Years would go by between new editions, frustrating eons of time where I would wonder if we'd ever find out what happened next with Roland the gunslinger and his ragtag band of companions. I recall reading The Wasteland, the third volume, on a bus to my college town during my freshman year, and Wizard and Glass, the fourth, while slacking off during graduate school. 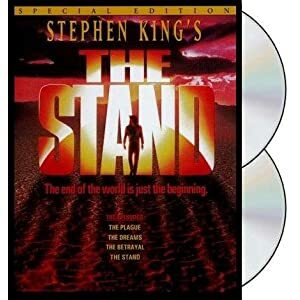 When the final three installments came out in relatively quick succession (some time after King got struck by a pickup truck while hiking along a road in rural Maine and was nearly killed, an influential event that prompted the completion of the series) it was almost too good to be true. So, that's all to say that when I discovered today that The Dark Tower series is to be made into films (plural) and a television series, all with the blessing of King and with Ron Howard on board to direct in both mediums, well… it's all a little mind blowing to be perfectly honest. It's particularly impressive that the films and TV series will be developed in conjunction with each other – a move that is both daring and makes great sense given the complexity and depth of the material. Howard is known as being a competent (if not always thrilling) big budget director so I'm deeply curious to see how he handles material that is a quirky mix of fantasy, western, and adventure. The plan is to start with the feature film, and then create a bridge to the second feature with a season of TV episodes. That means the feature cast—and the big star who’ll play Deschain—also has to appear in the TV series before returning to the second film. After that sequel is done, the TV series picks up again, this time focusing on Deschain as a young gunslinger. Those storylines will be informed by a prequel comic book series that King was heavily involved in plotting. The third film would pick up the mature Deschain as he completes his journey. They will benefit from being able to use the same sets cast and crew for the movie and TV, which could help contain costs on what will be a financially ambitious undertaking. Huge questions abound: who will play Roland? Will the transition from film to TV and back work? Will Howard be able to capture the material in anywhere close to the fashion that Peter Jackson reined in The Lord of the Rings? And how long must we wait to find out the answers? TV geek militants worldwide thirst to know!